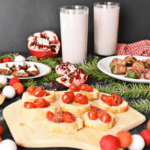 Three easy appetizers for your holiday party that are as delicious as they are simple! Christmas appetizers made easy. Slice baguette into ten 1/2 inch slices. Drizzle lightly with olive oil and salt. Bake on foil lined baking sheet for 10 minutes until crisp. Chop grape tomatoes, and mix with olive oil, chili pepper flakes, dried basil, and salt and pepper. Top crostini slices with grape tomato bruschetta. Serve immediately. Cut each Brussels sprout in half, for a total of 10 pieces. Cut bacon strips in half, for a total of 10 pieces. Roll each sprout in the bacon, placing the seam down on a foil lined baking sheet. (You can use the same baking sheet as the crostini.) Bake for about 25 minutes, until bacon is crispy. Serve immediately. Cut pitted dates in half. Stuff each date with about 1/2 teaspoon goat cheese. Place on platter and drizzle with balsamic vinegar. (If desired, place in oven for 5 minutes to melt cheese.) Serve immediately. The goat stuffed dates and bruschetta can be made up to 2-3 days before your party, so you save on prep time.